Hello Friends and Family of the Village! Fall has arrived in the Lower 9th. It’s back to school, back to work and back to blogging. Fall is a season that always gives me a sense of hope. Not just hope that the New Orleans heat will end, or that we are nearing the end of a hurricane season that has so far left us whole, but also a hope that the work we do here at the Village will continue to impact the lives of our community, our volunteers and our partners positively. Since it’s been awhile, I’d like to use this weeks blog to re-introduce ourselves: who we are, where we are & what we stand for. So, welcome to the Village’s blog. We’re so happy to share our experiences with you and to invite you to be a part of our family. Currently, there are three staff members at the Village. Our intrepid leader, the visionary, the big Kahuna. Mack’s dream for the Lower 9th Ward Village started in the wake of Hurricane Katrina. He grew up in the Lower 9th and has lived here for most of his life. Mack bought the warehouse that has become our home as a place to restore antique cars and furniture. However, after watching the destruction of his community, he felt led to become the change that was so desperately needed. Mack started to turn an old, flooded out warehouse into a community centre, particularly focusing on the needs of the elderly and of the youth in the Lower 9th, and helping people to return home. He has worked tirelessly for the last two years on behalf of his friends, family and neighbours to coordinate volunteer efforts, raise money and bring the life back to the Lower 9th one person at a time. Endesha Juakali is a long-time friend of Mack and a resident of New Orleans’ 7th Ward. He handles financial matters and keeping everyone in line at the Village. Jennifer is originally from California, but fell in love with NOLA when she moved here two years ago. She first met Mack and came to the village when a friend brought her to volunteer. After two days of scraping old paint and helping to fix the roof, she know that she was hooked. She just started as Director of Operations at he Village and is focusing on fundraising, marketing and programming. 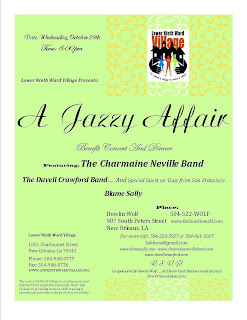 The Village is located at 1001 Charbonnet in New Orleans’ Lower 9th Ward. Lower 9th Ward Village is a community-driven, community-led non-profit based in the Lower 9th Ward in New Orleans. The main goal of the Village is to bring together the entire Lower 9th Ward and to empower community members to be self-sufficient and to sustain an equitable quality of life. The Village focuses on connecting the elderly and youth with services and providing care and guidance from the community as a whole. The Lower 9th Ward Village is holding Town Hall Meetings every 4th Saturday of the month. The Village will invite all nonprofits working in the Lower 9th Ward to speak a next Town Hall Meeting about the services that they currently provide to Lower 9th Ward residents and how to access those services. For more information, please call us in the office at 504-948-0777. Click on the link below to hear the interview of Jeremy Knoll and Merry Morse. Too old to be a camper? We also need kids 13+ to be program helpers!! Kids will participate in games, crafts, and all sorts of other fun activities!!! For the parents and grandparents!! We will also be hosting a small group for the adults of the Lower 9th Ward. Drop the kids off and come join us. If you have any questions, call 504-948-0777. Donate tab not working on website...! New Orleans' Lower 9th Ward, a culturally vibrant and historic neighborhood, was devastated in the wake of Hurricane Katrina in August 2005. As the neighborhood hardest hit by the storm and the subsequent flooding of the city, the Lower 9th Ward saw thousands of residents displaced and homes destroyed. Over four years later, residents are slowly returning to rebuild their neighborhood. But the Lower 9th Ward desperately needs services to rebuild and sustain the community. The Lower 9th Ward Village will help fill this void by providing a range of services, from literacy, job training and apprenticeship programs to recreational facilities and community meeting space. The Lower 9th Ward Village is a tax-exempt not-for-profit community center that will serve the residents of the Lower 9th Ward as they rebuild their lives and their community. The main purpose for the Lower 9th Ward Village is to serve as a focal point for residents returning to the neighborhood by offering a number of services in one centralized location, thereby contributing to community revitalization.